Confessions of an ADD English Teacher: They like me! They really like me! I think the grin on my face is so big right now, it might be visible from space. On a complete whim, I decided to enter the Bake for the Cure event. I had to make sure I had all the ingredients on hand, which is always a huge task. My craving lately has been cinnamon rolls and then I thought "ohh apple cinnamon rolls would be yummy." Then it hit me...what's better than apples and cinnamon? Caramel Apple Cinnamon Rolls. They took me nearly all day to make. It wasn't one of those easy peasy overnight cinnamon roll recipes i'm so fond of. This involved not only making a cinnamon yeast dough, but actually caramelizing the apples AND making a caramel sauce from scratch because I didn't have any store bought stuff. Well, the first place ribbon says it was! 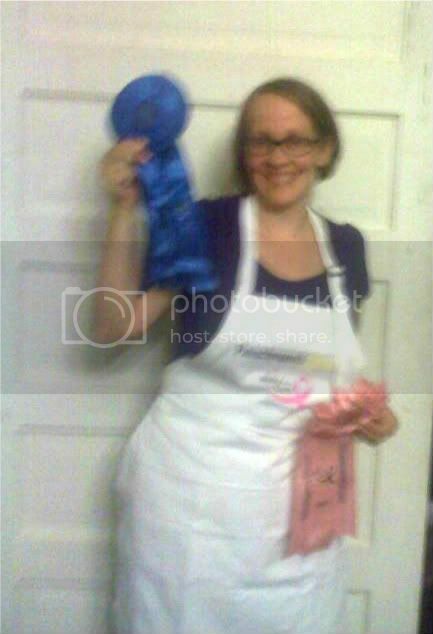 I've never won first place in a cooking contest before, and I wasn't expecting to win. It seems the only time I ever win at these fair contests is when I decide to enter last minute and just whip something together...well, not that these were whipped together, but you get what I mean. Leelee took the picture. I think she was shaking with excitement in my behalf. So are you all just DYING for the recipe? Are ya? Are ya? Ok. Just remember these are something you are going to drool over and never actually make yourself because they take stinkin' forever. Cream together the sugar, salt, cinnamon, and butter on medium-high speed until smooth. Mix in the egg. Mix in the flour, yeast and milk until a dough forms. Knead about 8 minutes until the dough is silky. Lightly oil a large bowl and transfer the dough to the bowl, turning once to coat. Cover with plastic wrap and let rise at room temperature for about 2 hours, or until doubled in size. Meanwhile, make the filling. To make the caramelized apples, melt the butter in a skillet over medium-high heat. Add the apple slices, sugar, cornstarch, cinnamon, and salt. Mix until the apples are evenly coated. Cook about 18 minutes, stirring occasionally. Remove from the heat and stir in the vanilla. Set aside to cool. In a small bowl, whisk together the sugar and cinnamon to blend; set aside. On floured surface, roll it out into a rectangle(about 12 x 14 inches for larger rolls or 9 x 18 inches for smaller rolls). Combine the sugar and cinnamon in a small bowl and mix to blend. Sprinkle the cinnamon sugar mixture over the surface of the dough. Evenly distribute the caramelized apples over the top of the dough. Starting with the wide edge, roll up the dough. Pinch the seam shut, and with the seam side down, slice the log into your desired number of rolls. Transfer them to a prepared baking placing the rolls about ½-1 inch apart. Cover loosely with plastic wrap and let rise at room temperature 75-90 minutes. Preheat the oven to 350˚ F. Bake for 20-30 minutes, or until golden brown. To make the glaze, combine the cream cheese and butter in a small heatproof bowl and microwave in 15-20 second intervals until it is warm enough to whisk together. Whisk in the caramel sauce, milk and vanilla extract until smooth. Whisk in the confectioners’ sugar until smooth. Swirl the glaze over the top of the cinnamon rolls. Let cool at least 15-20 minutes before serving. These look delicious! I'd love it if you shared them at my link party that started today at Project Queen. 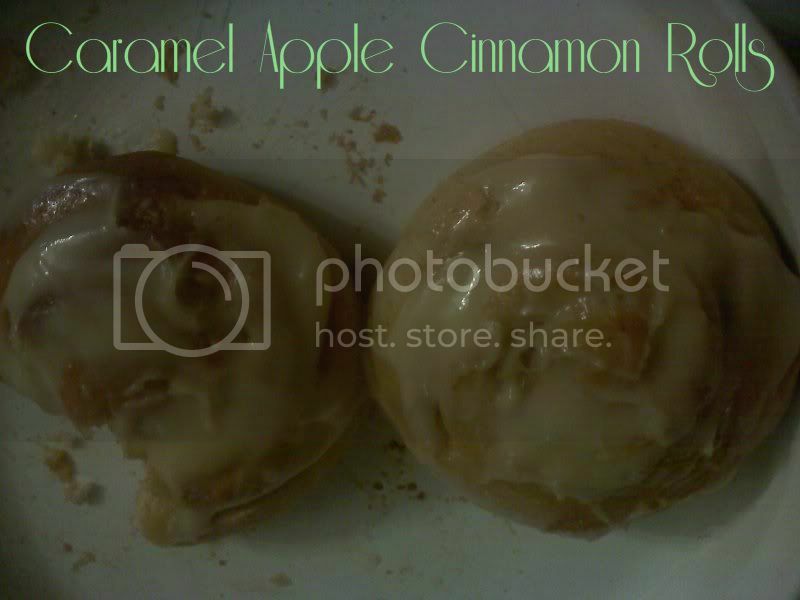 Hi Micki - just wanted to let you know that I have featured your Carmel Apple Cinnamon Rolls at Project Queen's #5 Linky Party Highlights. Hope you come back and link something up this week. Please don't forget to grab a button. Congrats! These look so good!